Exotic tropical fruit and citrus pair perfectly with top shelf tequila, triple sec, and orange blossom water in An Exotic Tropical Margarita… a unique and delicious twist on a much-loved classic! I have always included Mexican and Southwest recipes on Beyond Mere Sustenance due to the fact that I focus on local, fresh ingredients, and I have lived in California, New Mexico, and now Texas’ Rio Grande Valley, almost my entire life. I love the flavors. However, I have found pairing my recipes with wine difficult (if not impossible). As much as I love craft beers, I realize many of my readers do not, so I’ve gotten interested in mixology in an effort to have another option. A mixologist designs drinks that are seasonal and complementary to a given menu often using locally sourced, fresh ingredients, house made syrups, etc. I have discovered a new passion that began with the spicy mango margarita that was the base for my Spicy Scallop Shooters. My Tropical Margaritas will pair beautifully with many of my recipes including (but not limited to) Fried Oyster Tacos With Citrus Salsa and Tropical Black Beans and Rice. A good margarita is only as good as its ingredients. I had to learn this the hard way. I’m not one to drink liquor straight (as in shots), though I do love an occasional artisanal gin martini – “dirty” and straight up. When making margaritas, I’ve made a practice of reaching for the bottom shelf tequila. 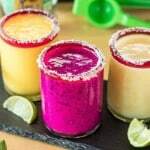 When I was discussing this recipe with my husband, he pleaded with me to get “better stuff.” I went with a 100% agave tequila, and we did a taste test before adding it to the blender. I had a half bottle of generic tequila on my pantry shelf. Oh my! The cheap tequila tasted like swill. The 100% agave tequila was smooth and peppery with a subtle burn at the back of the throat. You don’t have to buy an expensive bottle for your margarita, but please avoid the tequilas that are less than 100% agave (typically down on the bottom shelf). The agave is mixed with sugar cane, and the flavor does affect the margarita. A good 100% agave silver tequila (not aged) is a good choice for your margarita. 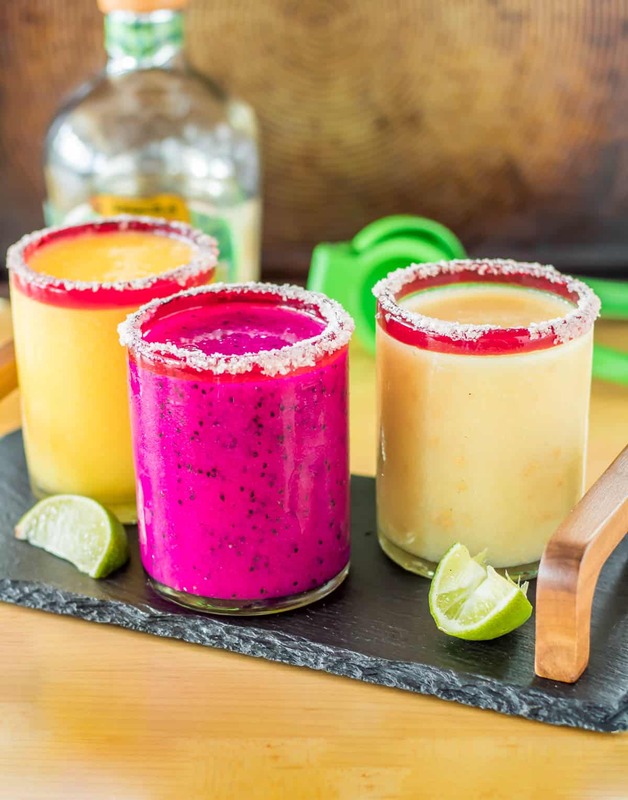 Once you’ve chosen your fruit (or fruits), and settled on a decent bottle of tequila, you’ll need Triple Sec or Cointreau, fresh limes, and agave sweetener. I add a bit of orange blossom water as well, but this ingredient is optional. I keep orange blossom water in my well-stocked pantry, and its bitter aromatic flavor adds a hint of complexity to the margaritas. You can substitute orange bitters or omit it entirely. My recipe serves 1 as I prefer to make them one at a time. Chill all the ingredients in advance if possible. Aclamaciones (cheers)! A tropical margarita made with local, seasonal fresh tropical fruit and good 100% agave tequila is a perfect sipper on its own, or paired with spicy food! Add ingredients (all but the lime wedges and salt for glass rim) to blender. Pulse until smooth. Squeeze and rub the lime around the rim of the glass. Press into salt. Pour margarita into glass. A decent quality tequila is important. Choose a 100% agave silver tequila for excellent results. Fresh lime juice is important. I love the little local key limes I found at the local farmers' market. It's always cocktail hour somewhere in the world ;-) Thanks Jennifer! 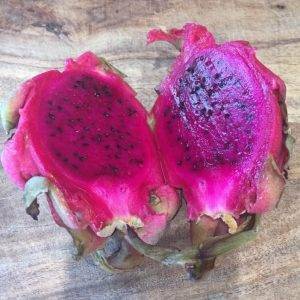 While I love how pretty the dragonfruit margarita is, flavor-wise, the maracuya and guayaba won hands down!